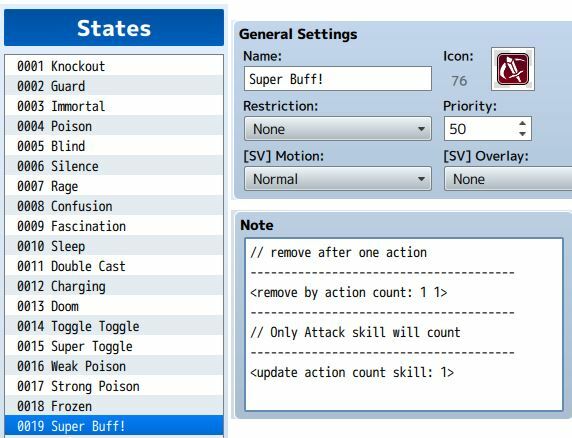 Do you have a buff state that will allow you to unleash a guaranteed critical strike, but only for the next action that you take? Or perhaps a state that will increase the effect of all healing spells, but only after a healing spell has been used, the state wears off? 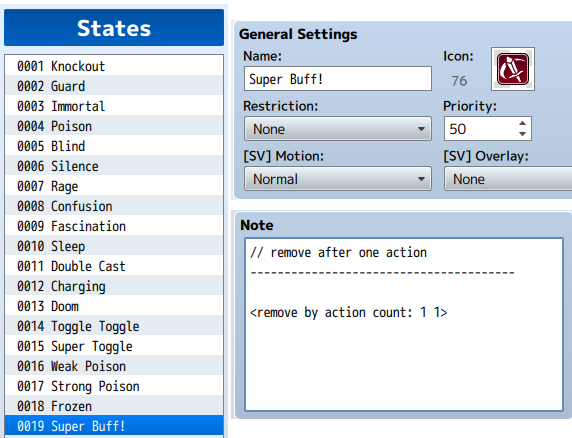 This plugin allows you to assign a new “auto removal” condition to your states: Remove State On Action. You can choose how many actions it takes for a state to disappear, and also whether only certain actions will affect the state. You can combine this removal condition with other auto-remove conditions such as checking for a certain number of turns, or taking damage, and so on. Download the plugin and place it in the “plugins” folder in your project’s “js” folder. Then open your Plugin Manager (F10), double-click an empty row, and select the HIME_RemoveStateOnAction plugin. Then it can randomly last anywhere between 1 and 3 actions. By default, every action that you perform will update the countdown. For example, if your state should last 2 actions, and you perform two actions in one turn, then the state will expire. This way, if you just keep guarding, the action countdown won’t be updated. You can add as many tags as you want if you want multiple skills to count towards it. Anyway to make this occur when certain skill types are selected? Is it possible to use the update count skill tag for every skill EXCEPT the one tagged? Is it possible to use for every skill EXCEPT the one tagged?